The Superior Fireplaces Glow Ramp series combines the beauty and convenience of gas logs with performance and heat efficiency. The Smokey Mountain ventless gas log set features a unique slanted burner system that offers the most glow and realistic yellow flames. 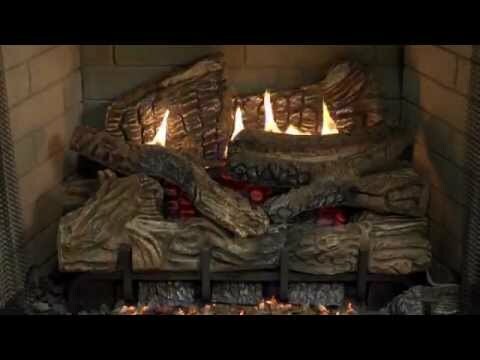 The realistic concrete logs, that sit on a heavy duty wood-burning grate over a lifelike ember bed, are cast from hand-picked natural hardwood and designed to look like they just came from a pile of wood. The unique Glow Ramp burner pushes up to 28,000 BTUs and performs the same as a radiant heater with fibers reaching temperatures up to 2000 degrees. With the push of a button, the auto-light easy ignition system lights the burner using a continuous spark system and a single AAA battery. This burner can be operated with the manual variable controls or the wall mounted on/off switch. Clean burning and 99 percent efficient, you can operate the logs with the fireplace damper closed or no venting required. For easy installation, this set includes a flex line as well as platinum bright embers, rock wool, and lava rock. With an ambient glow and a flame that dances and flickers like a real wood fire, you will be glad you chose a Superior Fireplaces gas log. 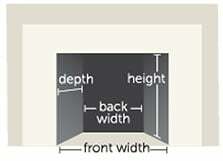 Minimum Front Width Required 20"
Minimum Rear Width Required 14"